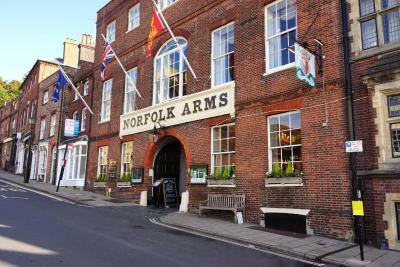 Lock in a great price for Norfolk Arms Hotel – rated 8.5 by recent guests! Location was good, nice bit of history, restaurant food was OK only. Lovely room, even though we were put in the wrong room by accident. Very good location. Very clean and cozy. Nice staff. Great breakfast. Nothing to complain. Value every penny. Fantastic location. Great food in the restaurant with boxing day menu. Lovely little bar in restaurant side. Friendly and attentive staff. 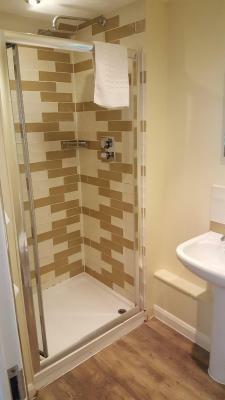 Lovely, clean, spacious rooms with hot shower and bath. Inclusive breakfast was really good. Lots of choice. Linen and towels were of great quality. The bed was really comfortable. The fires in the hearths were welcoming, and the small reception rooms were cosy and inviting. It was a very good thing I could open my windows as the room got too hot with the radiator on full blast. The parking was very convenient. Location is fantastic being in the centre of the town. The breakfast was super and the building is lovely too. Great location, friendly staff, loads of character. Ideal location for visiting the castle. Great central location. Very comfy bed and reasonable breakfast. Staff were very friendly and helpful. Norfolk Arms Hotel This rating is a reflection of how the property compares to the industry standard when it comes to price, facilities and services available. It's based on a self-evaluation by the property. Use this rating to help choose your stay! 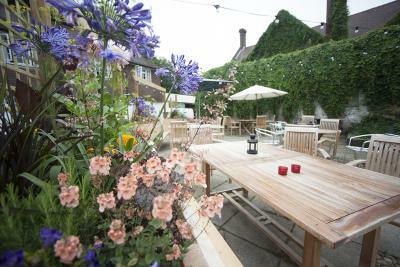 One of our top picks in Arundel.Norfolk Arms Hotel is 10 minutes from the coast at Littlehampton. 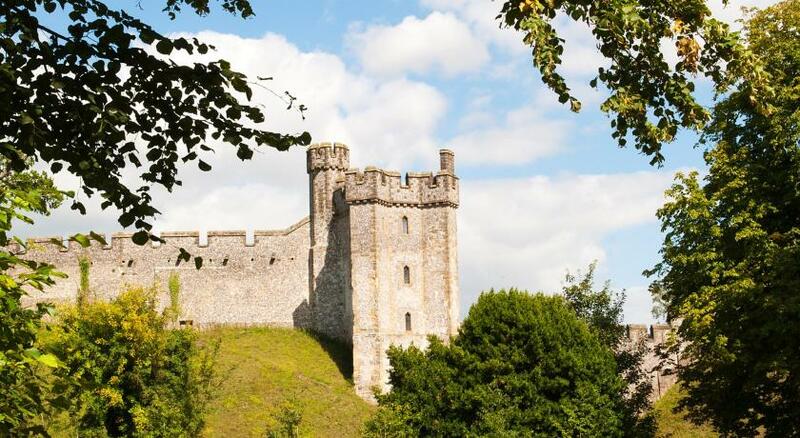 Under the battlements of Arundel Castle, the historical hotel has rooms with period features. Surcharge parking is available on site. 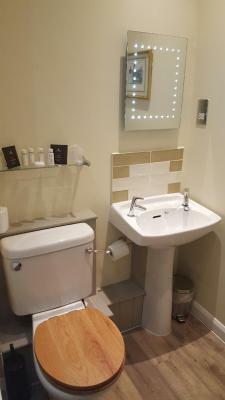 Set in a Georgian coaching inn, the individually designed rooms at the Norfolk Arms have an private bathroom, tea and coffee facilities and satellite TV. Many boast unique character and traditional charm. The Castle Restaurant serves a traditional British menu using seasonal and local produce. The 2 cozy bars offer local ales and Wi-Fi access, and serve afternoon teas, light meals and snacks. Room service is also available. 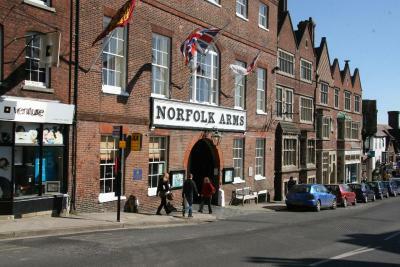 Built by the 10th Duke of Norfolk, The Norfolk Arms Hotel is just steps from Arundel Castle. With the scenic River Arun close by, the hotel is surrounded by the beautiful countryside of West Sussex. Lively Bognor Regis is a 20-minute drive away. Surcharge parking is available on site. 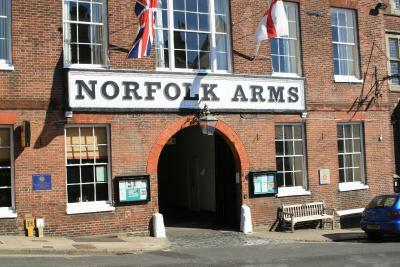 When would you like to stay at Norfolk Arms Hotel? 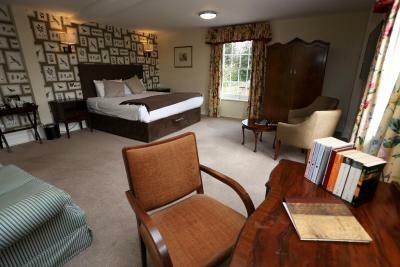 This room has a double bed, flat-screen TV, tea/coffee making facilities, hairdryer and free WiFi. 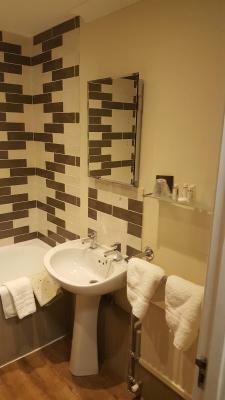 Each room has an private bathroom with a bath or a shower, and complimentary toiletries by the White Company. These rooms feature a single bed, a flat-screen TV, tea/coffee making facilities, hairdryer and free WiFi. 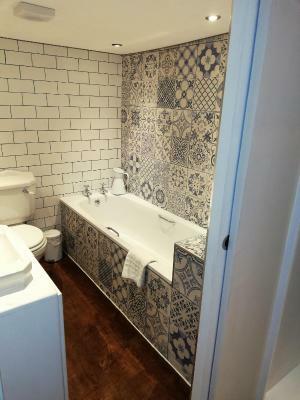 Each room has an private bathroom with a bath or a shower and complimentary toiletries by the White Company. These spacious rooms contain a double bed or 2 twin beds, a flat-screen TV, tea/coffee making facilities, a hairdryer and free WiFi. 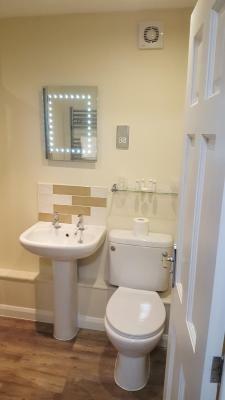 Each room has an private bathroom with a bath or a shower, and complimentary toiletries by the White Company. 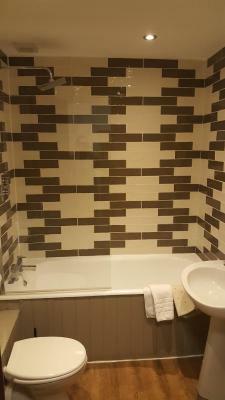 Please specify either a double or twin room at time of booking. All requests are subject to availability. House Rules Norfolk Arms Hotel takes special requests – add in the next step! 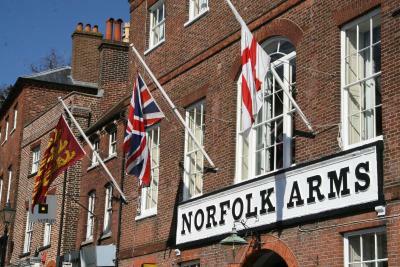 Norfolk Arms Hotel accepts these cards and reserves the right to temporarily hold an amount prior to arrival. Please note that the hotel does not have a elevator and some rooms are limited in height, which may not be suitable for guests with mobility restrictions. Ground floor rooms are available if requested. You can use the Special Requests box when booking, or contact the property directly with the contact details provided in your confirmation. On Sundays and Mondays, it is not possible to check-in after 23:00. Please note that the hotel hosts weddings and private functions most weekends, so there may be some noise. Please note there may be limited dining and leisure services at this hotel over the festive period. Please contact the hotel directly for more information. Lovely, comfy, quiet and clean room. Breakfast was great (and nice and hot). All the staff were friendly, particularly enjoyed visiting the Norfolk Tap for amazing beers. Martin, Scott and George in the Tap were really friendly, and it made for a great little break. Also excellent value for money if you pick the right day! Poor communication over times for breakfast. Some guests were turned away as breakfast staff cleared away buffet before the time that receptionist had said breakfast was available. We had cooked breakfast but fruit and toast was cleared away before we could have any. Not good that breakfast waitress just adopted a hard attitude and blamed chef with "you know what chefs are like" comment. We had a long list - toilet seat nearly coming off, toilet holder the same, no toilet rolls on arrival, meanness with supplies - one tiny piece of soap for two basins, no of sachets of tea coffee milk barely gave two drinks. Water dripping across the ceiling into the floor and onto the bed. No sandwiches in the bar. Reported list quietly to reception but no apology let alone any recompence! Having to take 50 stairs to the room which had no shower just a bath with an enamel jug. Bit of a throw back. Very warm due to very low ceilings. Location great as in the main street. Great character in the hotel. Very friendly staff except those serving breakfast!! I was seemingly overcharged for the room and denied my early booking discount! Told by hotel reception on arrival that there was a 3p discrepancy on my payment made on credit card and that it would have to be sorted before departure!!!? I queried the amount I had paid through booking.com which was an overpayment!! Then told to contact booking.com over this!! Which o did and they said it was the hotel making a credit card retention fee which I should get back within 12 days??? All very confusing and the hot water did not work in the shower!!! The hotel is in a prime location in Arundel! The tap bar was great with fantastic Barman and selection of beers. The hotel exceeded my expectation entirely. I got so much more than I was expecting from the price I paid. The room was large yet cosy. The bed was vintage but comfortable. The bathroom was huge with a lovely deep bath and big TV on the wall. I could very well recur. The bed was a bit too firm and pillow rather hard. References to the history on the walls. Sadly there are too many issues with this hotel to recommend it. On check in we asked to reserve a table for dinner in the restaurant but were told that because they had a function that evening they could not take a table reservation. Off to a bad start straight away. We booked what they describe as an "Executive" room. Well they squeezed a large double bed into the room, there was insufficient lighting to read and no light at or over the desk. Worst though was the bathroom which had nowhere to place a toiletries bag other than the bath side or a very narrow ledge concealing pipes. 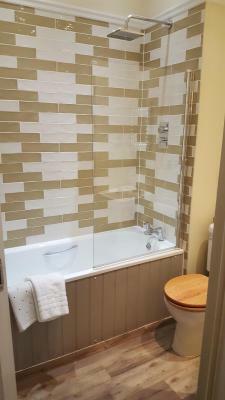 The towel rail would just about take 1 bath towel. The room would be considered at the most basic level for a hotel. To call it an executive room is ludicrous. We hate to think what a standard room is like. The Wi Fi in the hotel only allows one device to log in per email address. If like us there are two iphones and an ipad you need to have three email addresses, one for each device. Location was excellent, right in the centre of Arundel- our room had a view of the castle, which was lovely. The staff were all very friendly.